California is not only the most populous state, it's also one of the richest and best-known, with people all over the world being highly familiar with cities like Los Angeles and San Francisco due to their huge cultural significance and attractions. The Golden State is home to a long list of beautiful cities and amazing landmarks, as well as having an exceptionally long coastline and some of the best beaches anywhere in America. Whether you're up among the redwoods in Northern California, enjoying the pristine peacefulness of Big Sur in the central area of the state, or surfing some waves with your buddies in locations like Malibu, the California coast has a lot to offer for every kind of traveler. The full stretch of California coastline is also sometimes known as the 'Golden Coast' due to its beautiful golden sands and wonderful sunny weather that lasts for large parts of the year. There's a lot to love about the California coast, with many people driving along the world-famous Pacific Highway, stopping at various cities and landmarks along the way and admiring the incredible beauty of the Pacific Ocean as they go. If you're planning an RV road trip along coastal California or simply looking for a good seaside RV park to check out in the area, you've got a lot of great options to choose from. 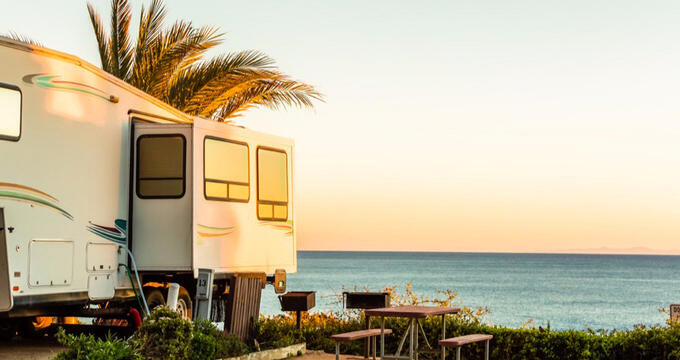 Some of the finest RV parks in the United States can be found along the Golden Coast; read on for full details and overviews of some of the best California coastline RV parks. Located to the west of Bakersfield, just north of Santa Maria and a few hours away from Los Angeles along the Pacific Highway, Pismo Beach is one of the prettiest little spots on the Golden Coast. The city is home to several interesting landmarks and attractions like the Dinosaur Caves Park and Monarch Butterfly Grove, with the local pier also being a great hang-out spot for locals and tourists alike. If you're looking for a great RV park on the California coastline, Pismo Coast Village RV Resort is an excellent option and really lets you enjoy all the fun of the Pismo Beach area, while also offering some superb amenities and facilities for guests of all ages. Pismo Coast Village RV Resort is a huge RV park with a whopping total of 400 full hook-up sites laid out neatly across 26 acres of beautifully landscaped grounds. The RV park includes some highly impressive and useful amenities like a heated swimming pool, a video game arcade that folks of all ages will adore, a laundry facility area with coin operated machines, cable TV channels, free Wi-Fi access all around the park, its own mini golf course, a general store selling plenty of useful items, and even a restaurant to keep you from ever being hungry or thirsty during your stay. With so many excellent amenities, you won’t want to leave this excellent California coastal RV park. If you really want to get away from it all and enjoy a quiet little slice of California coastline all to yourself, try booking a stay at the Westport Beach RV Park and Campground. Situated in the small community of Westport in Northern California, just west of the Mendocino National Forest, this RV park is a super oceanfront location for outdoor enthusiasts and nature lovers to enjoy. There are lots of great beaches right nearby and some awesome hiking, climbing, and biking trails to check out as well. Nearby Westport-Union Landing State Beach is a great place to spend some time for example, or you could head over to Westport Headlands Park for some private picnics and super sunset views. Definitely one of the best rated RV parks in all of the Golden Coast, Westport Beach RV Park and Campground offers easy access to all of these great locations and is a super spot for everything from fishing trips to romantic getaways. You'll find over 70 individual full hook-up RV sites at this RV park, with 50 tent sites available too for those who are interested in camping the old fashioned way. On-site amenities include two large bathhouses with hot showers and clean restrooms, a playground for younger visitors to enjoy, several game courts including a horseshoe pit, a laundry area, grassy spaces for picnics, and even a convenience store offering supplies and essentials. In every sense of the word, Malibu is one of the hottest vacation destinations on the planet. It enjoys amazing weather, has beautiful beaches, and is well known for being a popular retreat for the rich and famous, with many Hollywood actors and other celebrities frequently spotted hanging around the Malibu area. Well, now you can feel like one of the A-listers by staying at Malibu Beach RV Park, one of the top coastal RV parks in California. Situated right in Malibu itself, only a short drive away from Los Angeles and other key locations like Hollywood, this RV park is a great place to base yourself for all kinds of outdoor recreation activities and exploration. Malibu Beach RV Park is actually the only RV park in Malibu, so it's a very exclusive location and offers several RV spaces with views of the beach and Pacific Ocean, so you can really enjoy the California coast like never before at this amazing RV park. The park itself is open all year long and features large RV sites, with over 140 individual spaces overall, and plenty of great amenities like coin operated washers and dryers, a convenience store selling food and RV supplies, bathrooms with heated showers and clean toilets, a game room with several fun activities to enjoy, propane sales, a dump station, a TV area, wireless internet access, and much more.